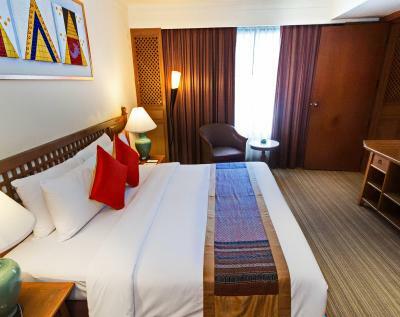 Lock in a great price for Silom Serene A Boutique Hotel – rated 8.4 by recent guests! Great hotel! Staff were very friendly! 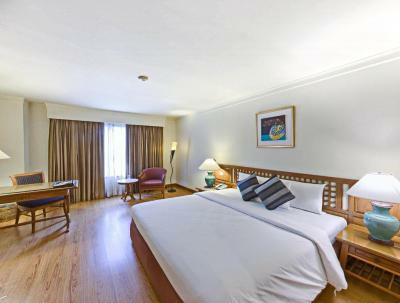 Superbly clean rooms, comfortable bed, excellent WiFi. What more could you want! lovely and helpful staffs! All staffs are so nice! even that security guard , so helpful ! The gentleman who checked me in was wonderful even though I came after midnight due to a flight delay. They were very quick to give me a new room. 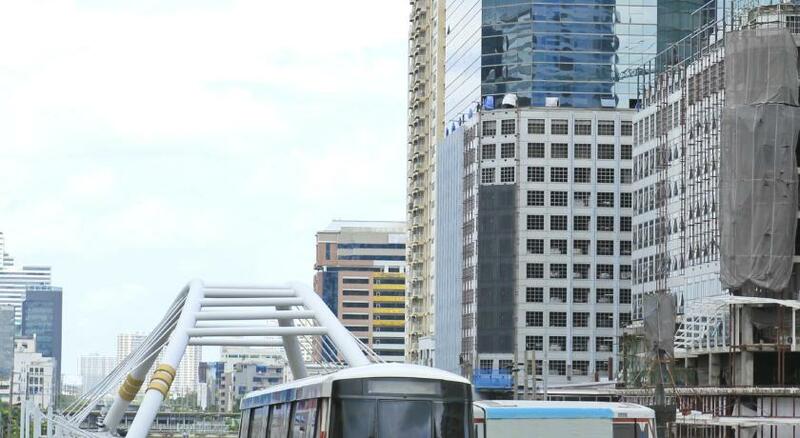 The location was great near both the MRT and BTS. 7/11 was nearby and there are a few restaurants nearby. The bed is very comfortable. the staff was incredible, very accommodating. Location was very convenient. Would stay there again! Location is pretty close to nightlife area. Walk distance to BTS station. 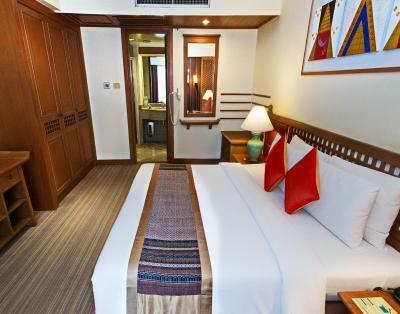 We stayed two nights at Silom Sirene, but wish we could have stayed longer. We arrived early to the hotel at about 12:30PM, but they allowed us to check in anyway. 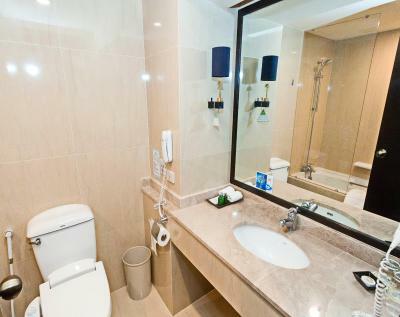 The room is spacious and clean, so is the bathroom which has a bathtub and Japanese-style toilet. The WiFi connection was strong, but it would disconnect on its own and we needed to login again. 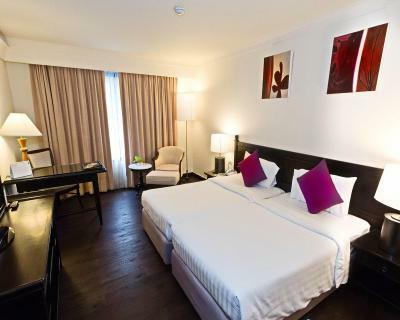 The hotel itself is in a nice area and isn't far at all from a night market and Soi 2 & Soi 4. We would definitely stay here again. 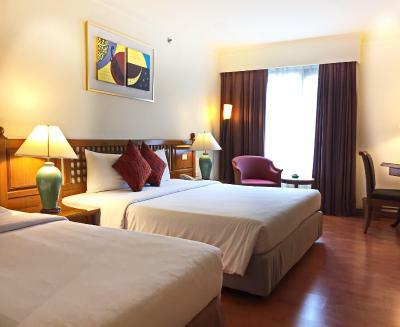 Silom Serene A Boutique Hotel This rating is a reflection of how the property compares to the industry standard when it comes to price, facilities and services available. It's based on a self-evaluation by the property. Use this rating to help choose your stay! 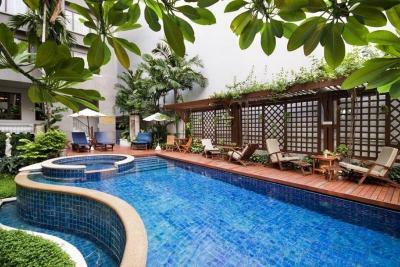 One of our top picks in Bangkok.Set within landscaped tropical gardens in Bangkok’s Bangrak area, Silom Serene is within 0.6 mi from Lumphini Park. This boutique hotel offers elegant accommodations, a restaurant and an outdoor pool. 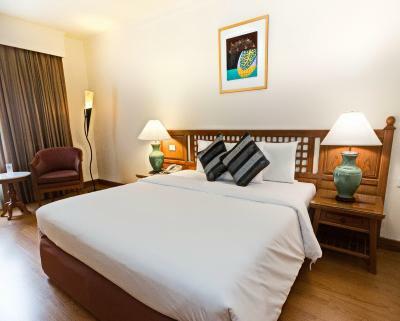 Rooms at Silom Serene come with wooden flooring and furnishings. 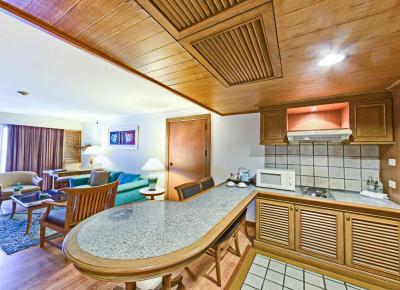 Each room has cable/satellite TV, a safety deposit box and a fridge. 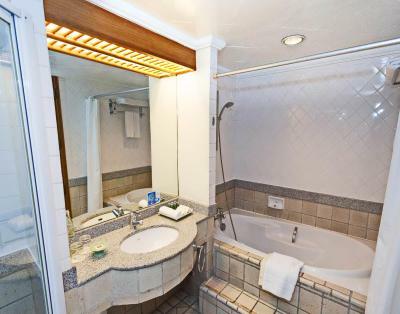 The private bathrooms are fitted with a bathtub and shower. 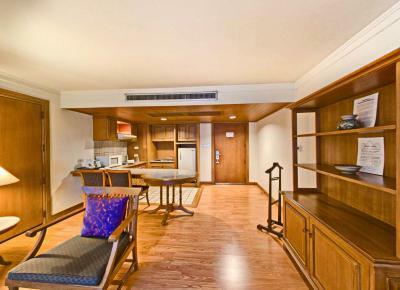 Some rooms also have a living room and kitchen with dining area. Guests can exercise at the fitness center, or relax in the sauna. The hotel has a full-service business center and a reading room. Ormthong Restaurant serves Thai and international dishes, while drinks and snacks can be enjoyed at the coffee shop and bar. Room service is available 24 hours daily. 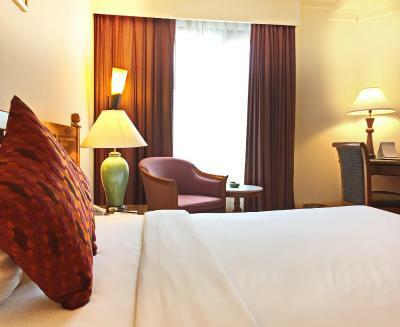 Silom Serene Boutique Hotel is a 30-minute drive from Suvarnabhumi International Airport. 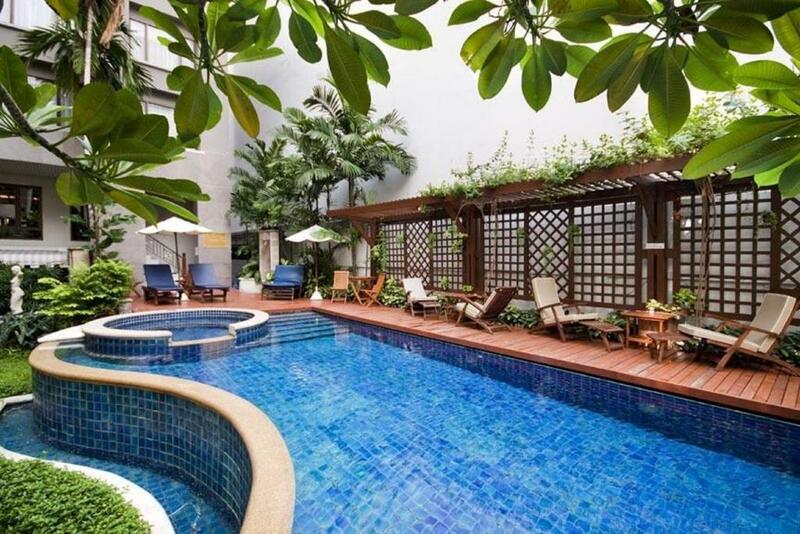 When would you like to stay at Silom Serene A Boutique Hotel? 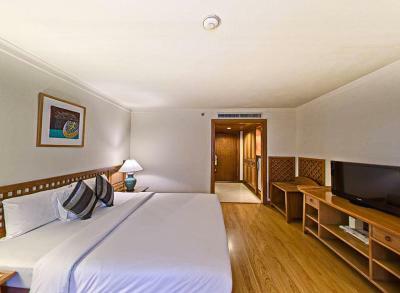 Larger air-conditioned room has a cable TV, a minibar and a safe. 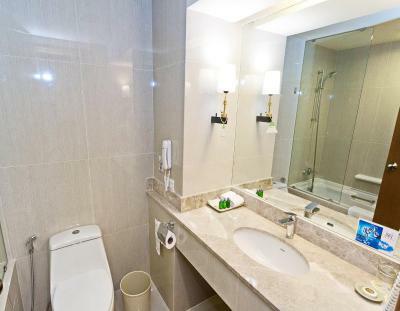 An private bathroom comes equipped with a bathtub, a hairdryer and free toiletries. 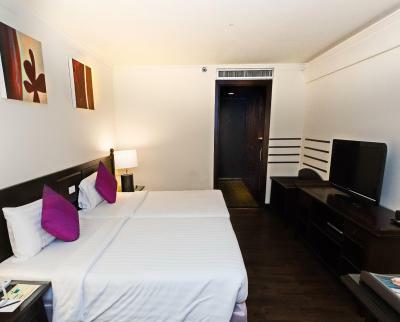 Air-conditioned room features a cable TV, a minibar and a safe. 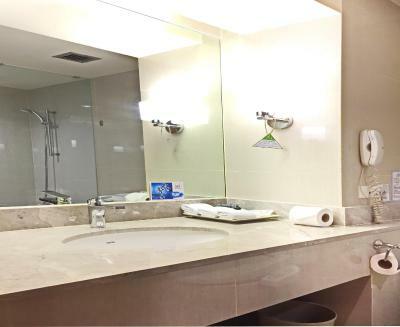 An private bathroom includes a bathtub, a hairdryer and free toiletries. 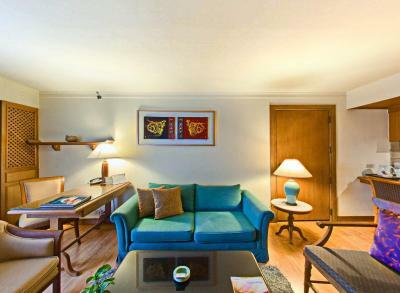 Spacious suite has a living room, a kitchenette and a dining area. It comes equipped with a cable TV, a minibar and a safe. 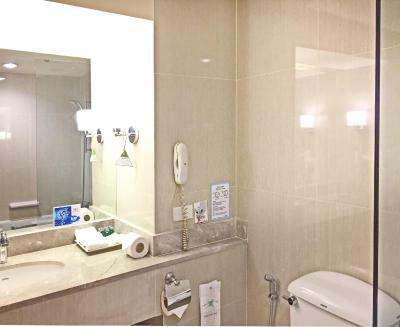 A private bathroom has a bathtub, a hairdryer and free toiletries. 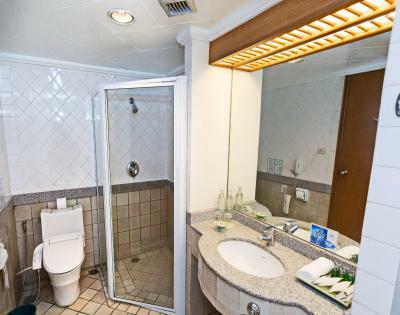 Offering more space, this nonsmoking air-conditioned room comes with a cable TV, a mini-bar and a safety deposit box. 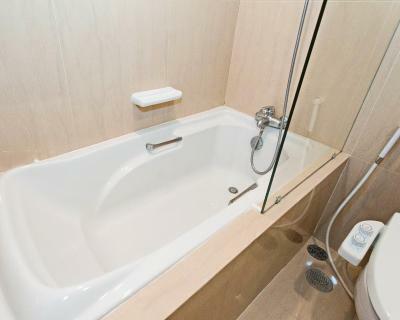 Its private bathroom is well supplied with a bathtub, a hairdryer and free toiletries. This suite features a flat-screen TV, sofa and air conditioning. 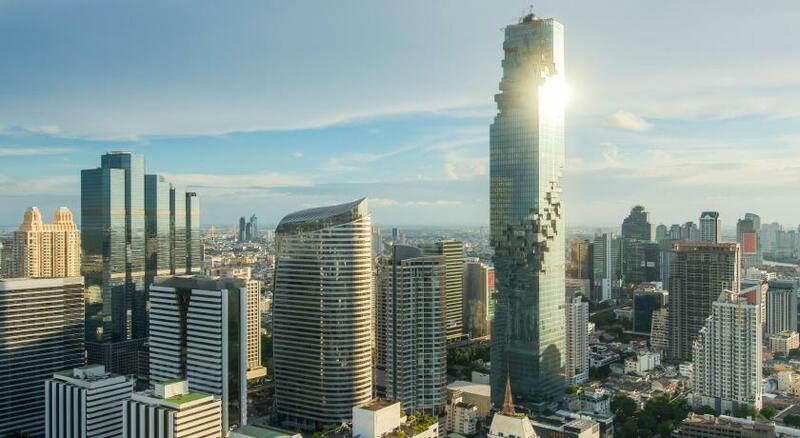 We are ideally located on Silom Road which is a well known area in Bangkok with easy access to all other places of interests. 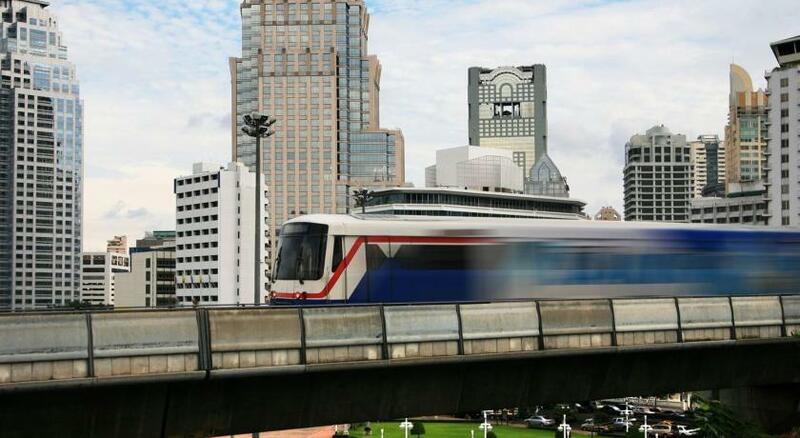 There are 2 sky train stations within walking distance and a subway station which is merely 15 mins. walking distance away. 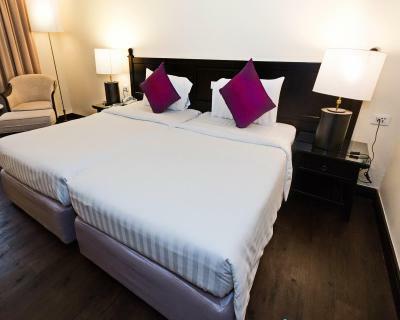 House Rules Silom Serene A Boutique Hotel takes special requests – add in the next step! Silom Serene A Boutique Hotel accepts these cards and reserves the right to temporarily hold an amount prior to arrival. Just that the water runs off the edge of the shower and makes the floor extremely wet! The breakfast had limited choices and the pool area was quite small. The location was ideal. 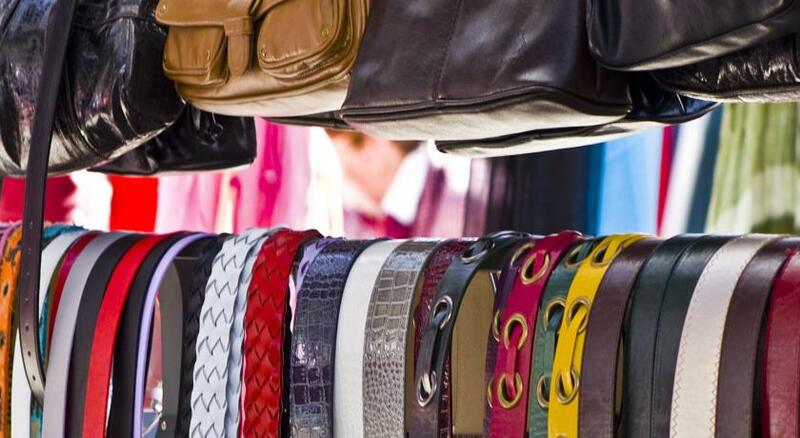 It was not far from the main street and it is a 10 minute walk to the nearest BTS Station. A lot of dining options nearby. The size of the room was great. They even upgraded my room to an executive suite. 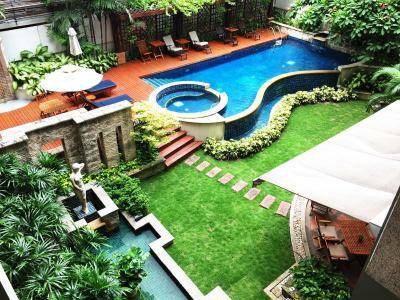 If you want to join the water madness of the Songkran Festival, then this hotel would be a good choice. Not far from the center of activities but you can still enjoy a breather from all the frenzy and festivities. Great restaurant. 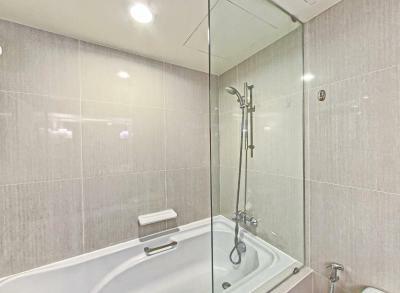 Comfortable, nice beds, clean, big tub. We had a room with a ajoining door to the next room, 501b. On the last night at 2am the room next door was very noisy, and then again at 7am, So had no sleep on our last night. Lovely hotel with pool. rooms are large. Very good location. Breakfast was very poor with little choice. Waste of money. Swimming pool had gone of and was cloudytotally unusable and staff did not seen to know how to treat it. We cancelled our second stay sadly. Pool was not large but nice and close to bar. Room very comfy and a good size. Film channels made a change from the usual Thai tv choice. Restaurant was good. I had a delicious burger there one evening and there was a good selection at breakfast. Underground parking was nice and safe with a very nice man keeping an eye on my motorcycle. The WiFi did not work in the room despite several attempts by the helpful young trainee. This was really annoying as I had to stand outside in the corridor to read my mails and stay in touch with office and family. They will have to do dirt out this issue ASAP.